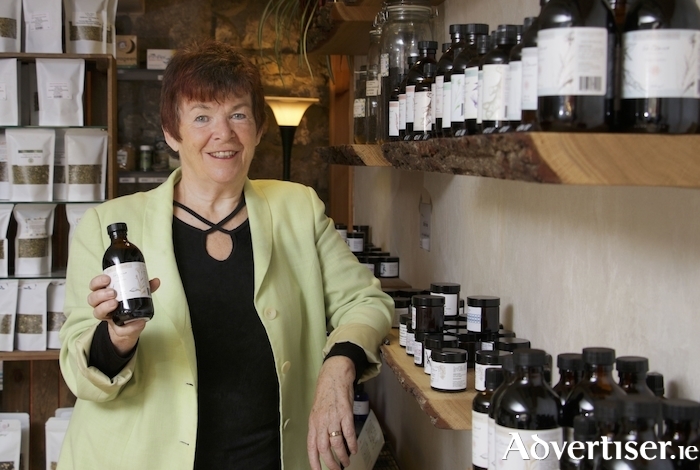 Combining the qualifications and skill-sets of both GP and herbalist, and with a passion for knowledge and healing, Dr Dilis Clare, owner of Dr Clare Apothecary on Sea Road, is a woman of enviable energy, commitment, and wisdom. Over an engrossing afternoon chat she outlined her journey through the worlds of mainstream and herbal medicines and shared some of the insights and passions which have defined her career to date. Clare’s disillusion led to her exploring the world of herbal medicine; “I love gardening and then I found a course in herbal medicine. At that time they were giving doctors educational grants. Talk about serendipity and synchronicity; the first herbal medicine science degree in the UK was just around the corner from my general practice in north London and I got a grant to do it! It’s like it was meant to happen. That said, I went into herbalism with a sceptical mind to start with. This is our indigenous medicine; the nettles, the meadowsweet, the valerian, the hawthorn, burdock, thyme, sage – these are the herbs I use every day. Having acquired her qualification in herbal medicine in 1999, Dilis opened her Apothecary on Sea Road and moved into her present premises, across the road from her first establishment, in 2005. From here she and her staff offer a wide array of herbal medicines, teas, tinctures and oils, as well as classes and clinics. Dr Clare is an eloquent spokesperson on the benefits of herbal remedies, a teacher of her accumulated skills and wisdom, and a versatile, sensitive, and imaginative healer for her patients. Galway is lucky to have her.